Business owners and executives ask many questions every day. They want to know “who” is doing this or that; “when” can I expect to see results or new activities in place; “what” do you need; “where” is that launch/showcase/speech taking place? 1) When he asked “how” his own train of thought immediately became more creative and excited about possibilities. 2) He became an enthusiastic supporter of new ideas rather than a barrier to them. “How can creativity work in our company? 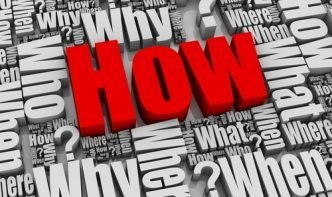 Ask that question every day and in every conversation with employees and see see how you can make more money. “How can we provide more value to you?” is the most important question you can ask every client and customer. Then listen attentively and take action. “How can we increase the value of our company?” Whether you’re a year or many away from an exit, asking how you can increase the value of your company will give you more profit to spend or to build wealth.